Top scorers in Europe: How do Mo Salah and Man City rank among highest-scoring players and clubs? Mohamed Salah has reached 19 Premier League goals for the season, but how does he compare to goalscorers across Europe and which side has scored the most goals overall? 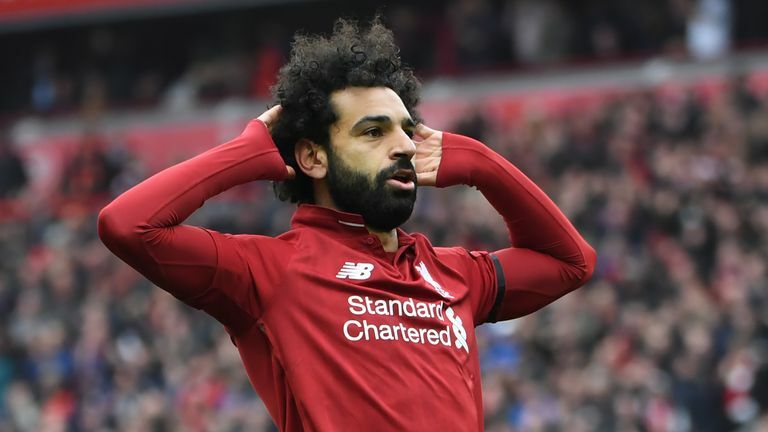 Mohamed Salah's blockbuster long-ranger helped Liverpool exorcise the ghosts of 2014 with victory over Chelsea and return to the summit on Sunday, but it was extra sweet for the man himself. When asked by Jamie Redknapp to reflect on suggestions he has struggled to replicate the heights of 2017/18, Salah said: "It's different [this season] as the opponents always play with two or three players on me so it's more difficult. "I'm happy with the result, and I'm still top scorer in the Premier League with [Sergio] Aguero of course, and we're first now, so that's the most important thing." Who'll win Premier League Golden Boot? Salah is Liverpool's Egyptian King, but will he reign supreme in the scoring charts come the end of May? Salah and Aguero cannot be separated in the race for the Premier League's Golden Boot - both locked on 19 goals and seven assists. Mane is in third place on 18 goals, with Raheem Sterling now just one behind the Liverpool winger following his double against Palace at Selhurst Park. Harry Kane's ankle injury may mean he doesn't add to his 17 league goals - level with Arsenal's Pierre-Emerick Aubameyang and one more than Eden Hazard - but a look across Europe shows that only Aguero makes the top 10 for goals this term in all competitions. Lionel Messi has been having a stunning season even by his standards, with his 43 goals in all competitions for Barcelona placing him eight in front of Bayern Munich's Robert Lewandowski. Kylian Mbappe is next on the list with 33 goals, while Aguero is the only Premier League player to make the top 10 with 29 goals across all competitions. Cristiano Ronaldo comes alive in the Champions League knockout stages, and his goal for Juventus against Ajax in Amsterdam last week moved him onto 25 goals in all competitions. Manchester City became the first side to reach 150 goals in all competitions this season against Crystal Palace, but how far behind are Barcelona and Paris-Saint Germain? From a team perspective, Gabriel Jesus' strike moved City onto 150 goals in all competitions this season - the first in Europe's top five leagues to reach that milestone. Ajax have scored 106 goals in 30 Eredivisie games this season, but no side across Serie A, La Liga, the Bundesliga and Ligue 1, as well as the Premier League, match Pep Guardiola's side for the number of times they have found the net. Kylian Mbappe's 33 goals have helped Paris Saint-Germain to second on the list behind City, while Barcelona are third with 122 goals in all competitions.